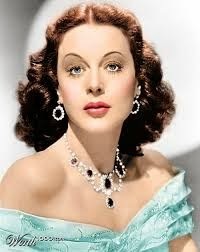 Here are five of Hedy Lamarr's films that I've enjoyed through the years. Feel free to comment on your own favorites. Charles Boyer and Hedy Lamarr rock the Casbah in Algiers (1938). This was Lamarr's first Hollywood film. 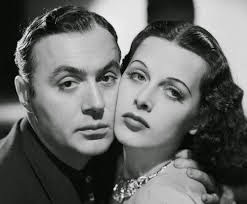 It was a huge hit and implanted Lamarr's exotic femme fatale persona in audiences' minds. Algiers tells the story of jewel thief Pepe le Moko (Charles Boyer) as he hides out from the authorities in the Casbah. There he meets French tourist Gaby (Lamarr) and falls madly in love. Algiers had a lasting impact on pop culture: The North African location and doomed romance inspired Casablanca and Boyer's Gallic love-making style was spoofed by Looney Tunes character Pepe le Pew. Amazon Prime; DVD. 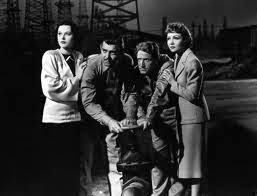 The cast of Boom Town (1940): Hedy Lamarr (left) Clark Gable, Spencer Tracy and Claudette Colbert. Clark Gable and Spencer Tracy were something of the Channing Tatum and Jonah Hill of the late 1930s and early 1940s. They made three films together in which Gable played off his manly man persona while Tracy was his sensitive, schlubby buddy. In Boom Town, they play Texas oilmen who battle over the black gold and the affections of good girl Claudette Colbert and conniving career woman, Lamarr. DVD; video on demand. 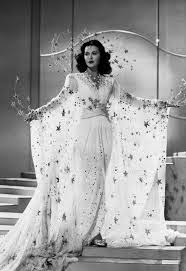 Hedy Lamarr in one of the fabulous costumes designed by Adrian for Ziegfeld Girl (1941). Lamarr stars as one of three women -- the other two are Judy Garland and Lana Turner -- who are vying for a spot in one of legendary producer Florenz Ziegfeld's Broadway shows. The highlight of the film is Garland singing "I'm Always Chasing Rainbows," but Lamarr has a very nice story arc of her own. For once, she get to play a real person and she makes her character believable and sincere. DVD; video on demand. 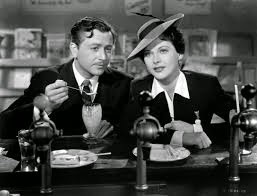 Robert Young and Hedy Lamarr share lunch and memories in H.M. Pullham, Esq (1941). Once again, Lamarr shines when she is asked to play something other than a femme fatale. Here she is a working class woman who was in love with a Boston aristocrat in her youth. This film traces their relationship through flashbacks and interior monologues. DVD. 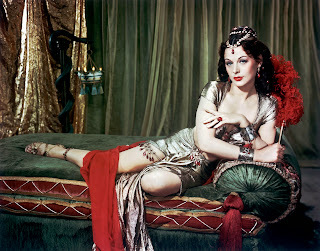 Hedy Lamarr in one of the Edith Head costumes she wore in Samson and Delilah (1949). This was one of the first big budget, sword-and-sandals epics that would become so popular in the 1950s. It was a huge commercial and critical success in its day (it won two Oscars for costume design and art direction) and it is still wildly entertaining today, mostly because it's so campy. None of the actor's come out smelling like roses, but Lamarr, playing the Biblical bad girl, Delilah, does exactly what is expected of her: She looks fabulous in the Edith Head costumes and throws herself at any man who is within her breathing space. Amazon Prime;DVD;video on demand.